When we think about the “Body of Christ”, which is made up of all true followers of Christ, we often think about big denominations and organizations. In the Body of Christ, churches, denominations, and organizations are a lot like “bones.” They are big and strong but they often lack flexibility and when they try to work together it can be painful. When bones come in direct contact, “arthritis” usually occurs. It is becoming increasingly clear that God has called us (Darryl and Kayo) to be “joints.” Healthy joints are made up of “ligaments” which hold the bones together and “cartilage” to cushion and smooth out the connections. Even though we are small, we play a role in connecting the “bones” across national, cultural, language, denominational, and many other lines which can cause painful conflicts and divisions in the Body of Christ. Darryl has been close to Phany, the co-founder of Kone Kmeng since 2000 when Darryl’s team of English teacher met and evangelized him. Phany went on to take the Gospel to his family and village, and in 2006, he started this organization. Darryl has been working behind the scenes as an adviser and mentor for Phany and this ministry for many years now. Glenn, a missionary from the UK was forced to return to his home country due to health problems so he could not continue as a member of Kone Kmeng’s Advisory Board. Phany invited Darryl to join the board in his place. Kone Kmeng Children’s Ministry partners with more than 100 Cambodian churches that in turn minister to thousands of children who are vulnerable to human trafficking (being sold or kidnapped and forced into child labor or child prostitution). 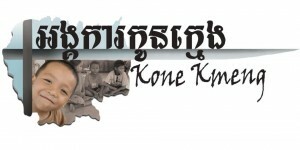 Kone Kmeng is involved in many kinds of ministries including: education, micro business incubation, health training, well drilling, latrine building, cleft palate surgeries, and dormitories for high school and university students. They also distribute International Fishers videos and materials through their network of churches. Samaritan’s Purse Cambodia Before departing Cambodia in June, Darryl supplied videos, radio programs, and Power Points to SP Cambodia. 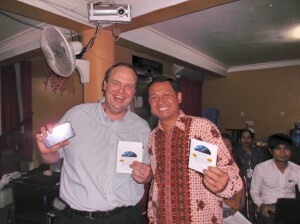 These resources will be loaded on tablets that SP Cambodia will distribute to many pastors across Cambodia. 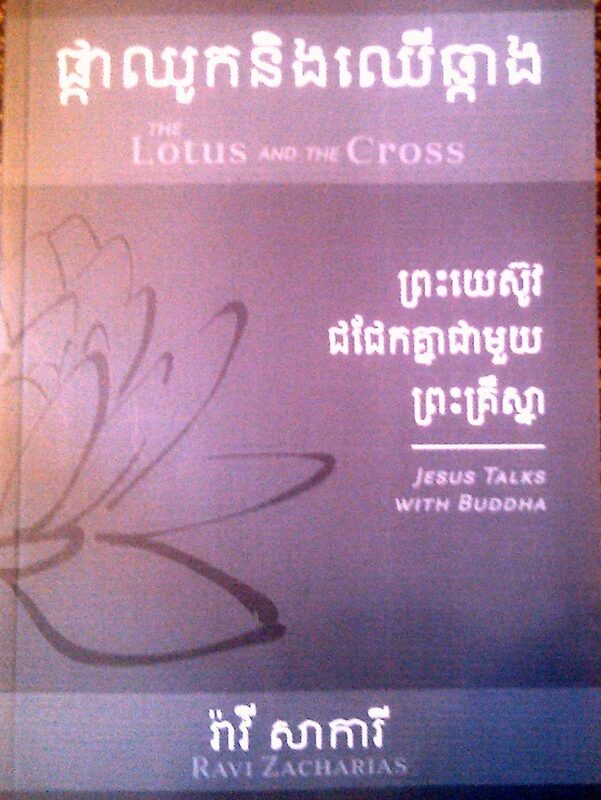 Samaritan’s Purse has already published the Cambodian language version of The Lotus and The Cross by Ravi Zacharias. 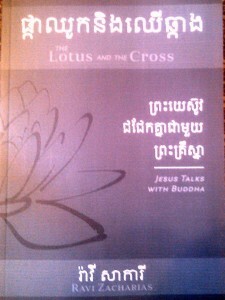 Darryl will serve as a consultant on the project to produce a video based on the Cambodian version of this book. Darryl is also working to help them connect with other media ministries so that they can produce more videos in the Cambodian language in the future. Songkeum Khmer Christian Media A few years ago, while a short term team from CC La Mirada was preparing to come to Cambodia, they met Mary Anne a Cambodian-American who had a unique “joint in the Body of Christ” ministry which connects Cambodian-American Christians together by videoing Cambodian church services and broadcasting them on local cable channels and online. In 2013, the team introduced us to Mary-Anne, her mother, and other Cambodian-American Christians. The mother and daughter told us an amazing true story of their escape from the Khmer Rouge (Communist Cambodians as brutal as ISIS). When the KR took control, many Cambodians who were in the Navy of the old regime, fled the country aboard warships. Mary Anne, then a baby, and her family escaped on a stolen Cambodian Destroyer. Mary Anne has invited Darryl to join the Board of Advisors of Songkeum TV as well. Darryl’s role will be to help connect the Cambodian-American Christians to the Cambodian Body in Cambodia. Both groups have needs that can be met and blessings that can be shared, only through connecting with each other. We have had a blessed time in the USA visiting our senders, friends, and relatives in California and Missouri. We are now in California until we return to Cambodia on August 11. We can be contacted via e-mail at darryl@sgwm.com or 562-241-6740. As “faith missionaries” (we depend completely God to supply our needs through free-will donations) our current and future ministries in Cambodia and beyond depend completely on the faithful prayers and sacrificial investments our senders make in obedience to the Great Commission. If God is leading you to partner with us financially you can donate online by clicking on the button that says “Become a Financial Partner” Or, you can send checks payable to Saving Grace World Missions 17451 Bastanchury Rd #203, Yorba Linda CA 92886, 714-993-4801 be sure to include a note that you want donation to go to the “Record Family in Cambodia.” For our senders who wish to make donations from Japan please e-mail darryl@sgwm.com for instructions. 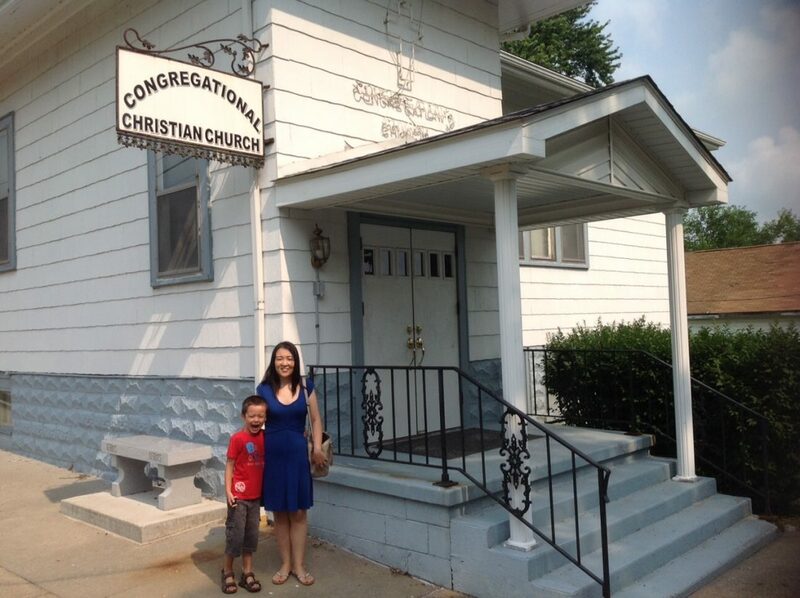 Kayo and Benjamin in front of a church in a small town in IL where Darryl went to church as a young child. The church Darryl’s father pastored closed because the young people moved away and the older generation passed away. 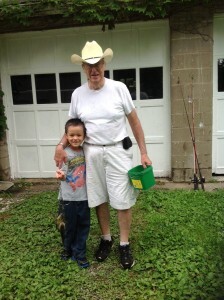 Benjamin learned many “Missouri skills” including fishing. Grandpa taught him how to fish and he caught 4. 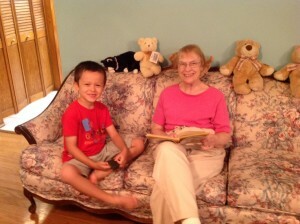 Grandma and Benjamin reading a book about Abraham Lincoln.